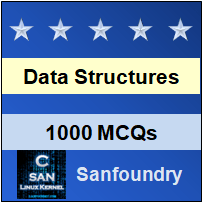 This set of Data Structure Multiple Choice Questions & Answers (MCQs) focuses on “Matrix”. 1. What is the order of a matrix? Explanation: By definition, the order of a matrix is number of rows X number of columns, generally denoted by mXn(not compulsory). 2. Which of the following property does not hold for matrix multiplication? Explanation: The corresponding elements from the row and column are multiplied and a cumulative sum is formed. 5. What does the following piece of code do? Explanation: Trace of a matrix is the sum of the principal diagonal elements. 6. If row-major order is used, how is the following matrix stored in memory? Explanation: It starts with the first element and continues in the same row until the end of row is reached and then proceeds with the next row. C follows row-major order. 7. If column-major order is used, how is the following matrix stored in memory? Explanation: It starts with the first element and continues in the same column until the end of column is reached and then proceeds with the next column. Fortran follows column-major order. 8. Which of the following are the uses of matrices? Explanation: Solving linear equations is a separate field in Mathematics involving matrices, Image processing stores the pixels in the form of matrices, and the graphs are represented with the help of matrices to indicate the nodes and edges. 9. What is the disadvantage of matrices? Explanation: Time complexity of a matrix is O(n2) and sometimes the internal organization becomes tedious. 10. Matrix A when multiplied with Matrix C gives the Identity matrix I, what is C? Explanation: Any square matrix when multiplied with its inverse gives the identity matrix. Note that non square matrices are not invertible.